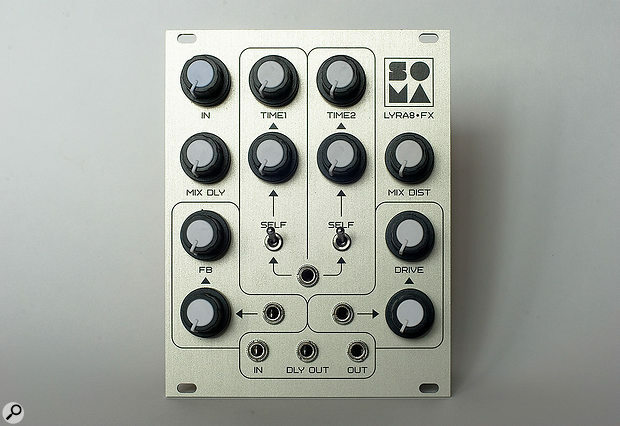 Soma Lyra8‑FX. Size: 20HP. Current: +12V 90mA, -12V 20mA. Towards the end of 2017, I met and fell in love with a Russian siren — and no, not via a dodgy dating site! Described as an 'organismic synthesizer', the Lyra-8 didn't merely produce wailing sirens, it excelled at screams, drones and a great many flavours of crunchy dissonance. 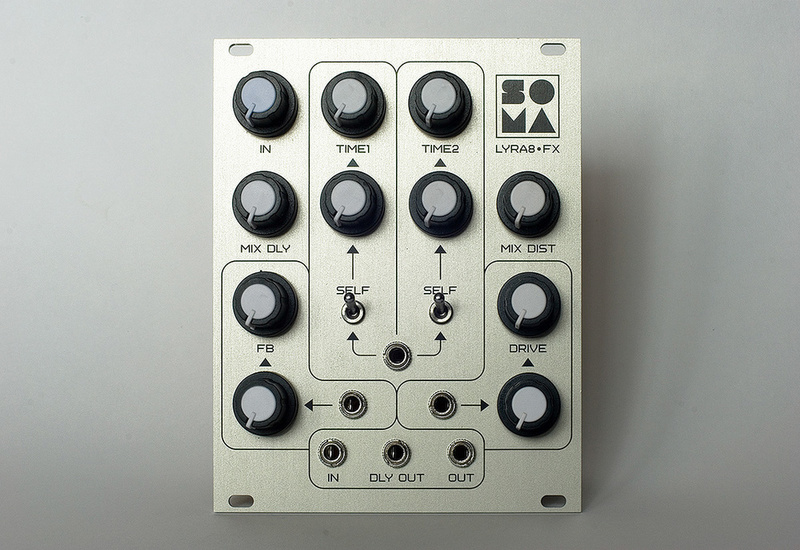 A significant portion of its prickly tones came from a dual lo-fi delay which was processed by distortion, and it's these circuits, in the same order, that Soma have brought to the Eurorack format. The Lyra8‑FX adopts its sibling's sturdy construction and is equally direct and approachable. Having set the input level, you simply dial up the delay and distortion amounts via dedicated mix controls. As a bonus (and unlike its synth predecessor) the module provides a separate output for the delay signal before distortion. Since this output is not affected by the Mix Delay amount, you can therefore process the raw delay signal while keeping control over the amount of delay entering the distortion circuit. In practical terms, you've got access to the delay and distortion simultaneously. The first thing I noticed was that the delay, like that of the Lyra, is heavily filtered. Given its lo-fi nature, this won't ever be a completely noise-free delay anyway, but the filtering does impose a fairly dark, muted character. I can understand the argument for noise reduction in a stand-alone instrument but can't help wishing the delay had been available here without filtering, leaving the user to revel in the noise and filth or to fine-tune it according to taste. This is a dual delay routed in parallel but sharing a common feedback loop. There's no way to tap off each delay separately, but you can modulate each delay time, either by a shared external source or by the delay's own output. Although the delay times aren't quoted, I'd estimate the longest to be just over 1 second, which raises the possibility of 'almost normal' echo duties. While this is certainly possible, the Lyra8‑FX is so murky and filthy generally that it makes more sense to give it primarily 'character' roles. As you crank the feedback past 12 o'clock, a metallic drone is introduced — for which you'll relish having CV control over the amount of feedback. One of the fun techniques I quickly adopted was to route a slow LFO to sweep the feedback and thus bring the drone in and out periodically. Using an external source to modulate the delay times will generate a variety of effects, from gentle vibrato and chorus to metallic flange and shimmering clouds of delay — delay that crosses effortlessly into spring reverb territory. The longer delay times are ideal for spicing up grooves and sequences, although any tempo synchronisation is necessarily a manual affair. Flipping either delay's switch to self-modulation is a means of introducing brittle overload and break‑up of the signal, before distortion gets to work on it. Although there's only a single drive control and mix amount, the distortion is every bit as satisfying as the Lyra-8's when it comes to bulking out and roughening up. The distortion tone can be shaped dynamically by applying CV control to the drive amount. Using a sharp, percussive envelope for this provides the kind of initial bite that drums, bass and even synth solos can always benefit from. Ultimately, the Lyra8‑FX brings a potent blend of grit and imperfection to the sometimes pristine world of Eurorack. While not a candidate for your only delay, it scores with its clear, hands-on operation and the range of reverberant, metallic tones, unstable delays and shifting waves of distortion.